Maybe you’re pulled into another, higher-priority project, and you need someone else to take on part of your existing workload. Maybe another person on the team has more experience than you do with a certain aspect of the project, and your project manager asks you to transition your work to that person. Or…maybe you’re just really good at delegating. 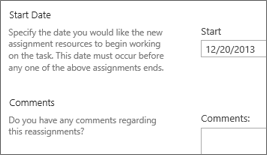 Find the task that you want to reassign in the Select New Resources grid, and choose a new team member in the Reassign To column. Set a Start Date for the transition, and add Comments if you’d like. Click Submit to send the new assignment to the project manager.